It's that time of year where I'm on the computer as little as possible and outside as much as possible - like 6:00 a.m. to 8:30 p.m. Here's what's been going on since last post. Totally Amazing! It can’t be beat. We love it. It’s fantastic. We are getting so much done, inside and outside – wow! Four of us loaded up fourteen 50’ raised rows with compost in one of the new gardens Saturday morning. This will be the Tomato Garden of 2018 when we get those plants in during the last week of May and first week of June. Dean started building the new greenhouse for the hot peppers today. I am hoping with all hopes it’s ready soon to get those eager plants in before they begin making peppers. 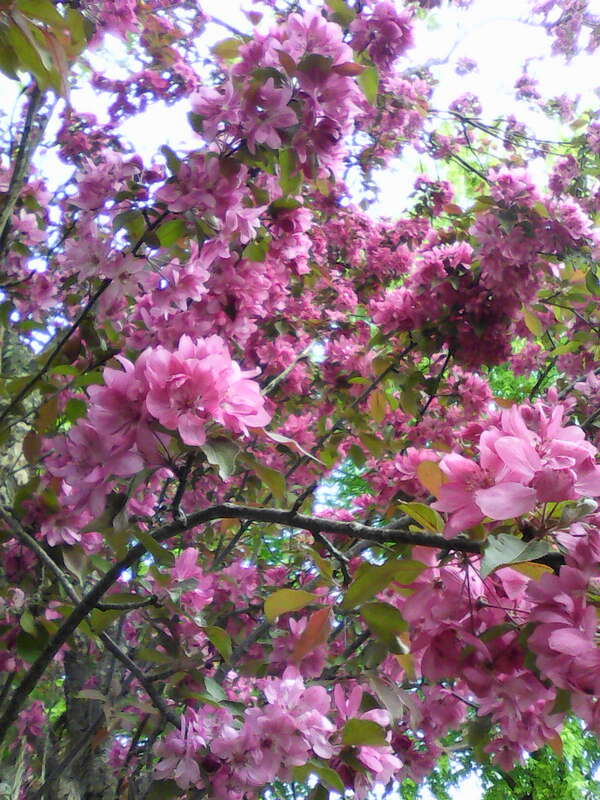 We’re still snapping the first flowers from them. The eldest kale in the greenhouse was starting to bolt so we transplanted the younger and baby kales to their outside garden today. 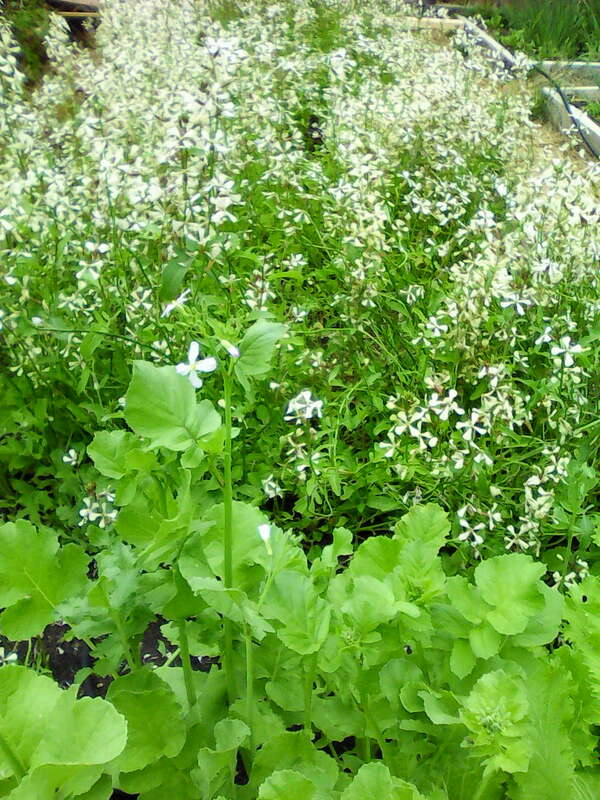 We’ve been sowing more salad greens and lettuces. While I was away last Monday, Jennie sowed carrots and they are already up! Onions we planted many days ago are showing their tops above the soil so we’ll mulch them this week. The other day we put floating row cover over the rapini and broccoli to keep those pretty little cabbage moths from laying eggs. Today we prepped the Edible Flower Bed and will arrange the plants tomorrow. We set up the first of many irrigation systems today. It’s quite a time saver when we can turn on the tap and get another project done while the hoses do the watering for us. After picking greens tomorrow we’ll transplant lettuces etc. to their outside gardens to make room in the Greenhouse for the cucumbers. It’s been a few years since growing them inside and I hope the cucumber beetles and squash bugs are long gone and have forgotten about us here. The long English cucumbers do so much better in the Greenhouse. We’ll be planting beans and more beets in the next several days. The leeks will go in the ground next week. If you wondered about your spinach order last week, there are a few kinds in the bag: bloomsdale, wild, strawberry and orach. I love the mix and the red really adds colour. Edible arugula flowers were also in your arugula bag. 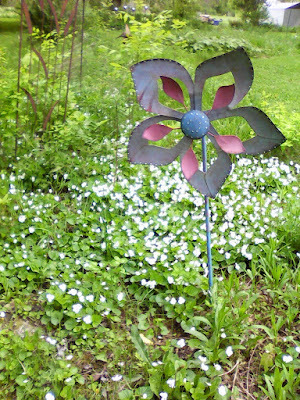 This week I’m pleased to have the opportunity of adding a few flowers like violets, cress flowers and pansies to your Salad Greens. 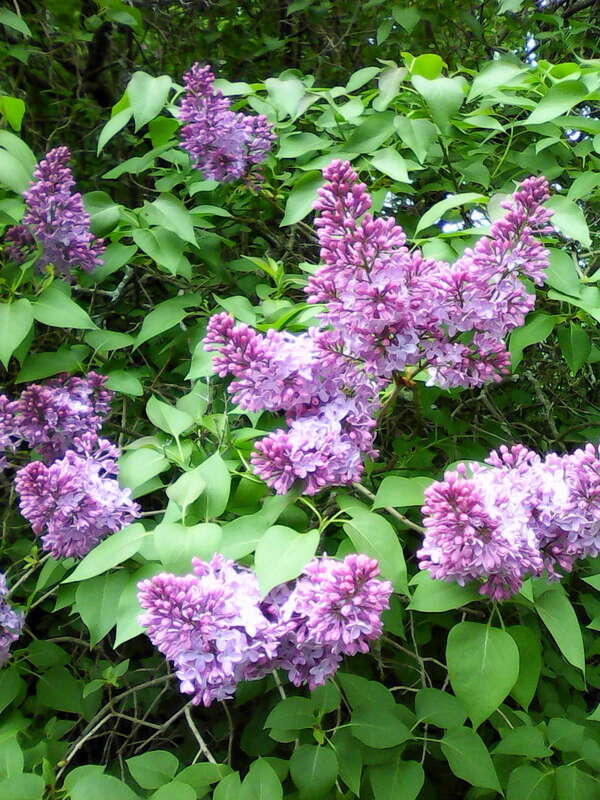 I expect lilacs and honeysuckle will be next. Robins are laying their beautiful blue eggs in nests in various locations, orioles must have babies since I hear them calling to them, flickers are having a great time eating from our backyard lawn and we hear killdeer calling all day. I saw some cardinal parents with their babies at the feeder and the hummingbirds are back. What a wonderful spring we’re having. When I pass by the blooming lilac bush I can hear the little hummingbirds chitchattering away. I assume their nest is in there. I found a killdeer nest in the row where we planted potatoes. The first day there were two eggs looking like oval shaped rocks, then three the next day and four eggs last time I looked. 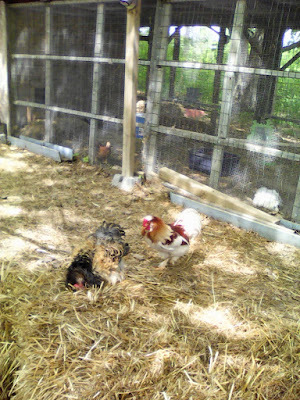 The mom and dad work pretty hard to steer us away. A chipmunk that wouldn’t get out from under the hood of the van (and believe me we tried) came to Kanata, Bells Corners, back to Kanata and then to Kemptville and home with us last weekend. It was pretty freaked when we arrived home, but apparently Tom saw one going back under the hood again. The plant sale is going well. It’s always a pleasure meeting fellow gardeners and discussing what’s going where and how long everyone has been at this, some only recently and some much longer. If you’re looking for more plants than are posted in my blog I probably have them in the gardens and can dig some up for you. I’m open to any suggestions that I may not even think of as I’ve been here 27 years and there’s a good variety of perennials and self-seeding annuals here. We’re selling our old tractor if you know of anyone interested. It’s a 1952 Massey Harris Pony. We’ve put quite a bit of money into upgrading and some other parts that I don’t need to know the names of but someone else might. We have all the receipts for work done and replacement parts like tires etc. The green peas and snow peas we planted what seems like eons ago are about 5” tall now and hundreds of leeks have been transplanted. Yesterday we sowed parsnip, radishes and all the beans and transplanted more broccoli. We sowed more lettuces for salads today, as well as chard, pak choi, green onions and arugula and transplanted celery we started a couple of months ago. I’m itching to get the cucumbers transplanted outside and keep watching the night temperatures. Potatoes are up. Dean is almost done the greenhouse and I’m hoping we can get the tiller in there this weekend (the grass is growing furiously while he’s building) so we can transplant ALL the hot peppers. Once the peppers are out of the greenhouse we can get some of those LongFellow and English Telegraph Cucumbers growing in there. It’s funny how we wait and wait and wait for spring, then it arrives and everything needs to be done right away. We’re also waiting for that Last Frost Date which I’m afraid these last few years has been as late as the end of May, then we can transplant the tomatoes, eggplants, sweet peppers and those other warm weather foods we love so much. Thanks again for all the yogurt containers. I’m still cutting up labels and may well have a good start on next year’s at this point. What a week, the new Hot Pepper Palace (aka greenhouse) is done . . . mostly. We took the entire day Saturday to till and hill prepping the soil for those hot peppers to be transplanted. So bring on the heat, we are ready. 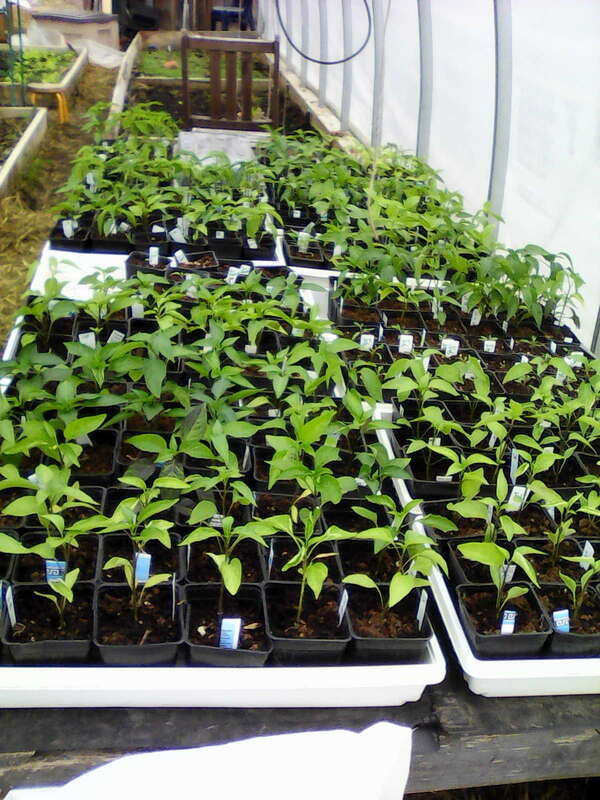 We have now transplanted every hot pepper that can fit into the greenhouse. The rest and the sweet peppers will need to wait until we can re-till the outside garden this weekend. We moved on to the new prepped Tomato Garden yesterday and have planted several of the many varieties. The irrigation system is only set up in one small garden now so we’re hand-held hose-watering for hours each morning and evening. Suppers around here are a little lame these days. We eat good food, just nothing too exciting and really late, around 9ish and then do the fall-asleep-before-your-head-hits-the-pillow thing. We still have plants for sale. See the Prices section for details. 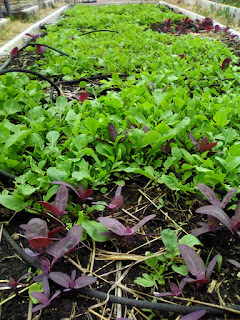 The lettuces are growing so nicely right now. The arugula, cilantro and spinach have bolted in the heat. No worries – we keep planting more all the time. There are only a few jars of tomato sauce left, but soon we’ll be eating other fresh foods like beans, peas, garlic scapes, beets, green onions and dreaming of tomatoes and cukes and zukes to come. is so pretty in the spring. and I do mean Green. was awesome! Apparently more than 1000 people came out for it. I’m not surprised at all by this number. It was a steady flow of eager gardeners, consumers, eaters and generally people happy to be around those of us who are helping take care of our earth. I sold everything I brought packaged and ended up cutting fresh greens by mid-afternoon. What I love best about this Fair is the various conversations that take place about plants, soil, seeds, growing, cooking and everything food. The musicians added a wonderful background to the whole affair. Welcome to you who signed up for weekly emails and future workshops. Please let me know if weekdays or weekends are best for your workshop enjoyment. Then I can set exact dates. Some of you suggested an additional workshop for Canning. That is definitely doable. Carol Pillar, Registered Holistic Nutritionist of Wholesum Approach, agrees to be on board for the Cooking Your Fall Crops Workshop. I’ll keep everyone posted on dates as you and I choose them together. In my hurry to get the brochures printed for the Fair I forgot to include an extremely important event here – THE PLANT SALE – which begins May 19 and runs for about a week after or until all plants are sold or planted in here. I try to keep the blog updated on the plants for sale and prices and will do this more as the Sale date approaches. Let me explain how to order our delicious, nutritious, organically grown, free from GMOs, synthetic fertilizers, pesticides, herbicides, fungicides goodness for your plates. I send an email every Wednesday (or Thursday if Wednesday gets a little out of control) telling you the exciting stuff going on here and letting you know what food is available for you to buy. You then let me know by the end of Thursday what you would like. When you order, I deliver to you Friday afternoon. If you live out of the immediate area you can pick up your order at an agreed upon time or I can deliver to you on the weekend. I deliver to Ottawa every weekend so that’s when you would receive your order if you live in Ottawa. Wow, a week ago, there was snow on the garden rows. Yesterday we could have worn shorts. Every Tuesday we begin our day by rinsing the sprouts on the go for Friday’s harvest and carefully picking microgreens for Little Sisterz restaurant in Spencerville. Then we deliver to Little Sisterz. Lately I’ve been delivering to Heather’s Healthy Harvest and B&H Grocery Store Tuesday afternoons. Upon our return, after opening the greenhouses, removing all covers from the trays of plants we then water any that need watering. We go back indoors to begin next week’s round of microgreens to ensure we have enough for all of you and Gina. When this is done, we’re on to outdoor planting. Yesterday we transplanted broccoli, rapini and kale to their chosen outdoor garden rows. We also transplanted lettuces, which we started a couple of weeks ago, to an appropriate spot in the greenhouse beds to grow beside the lettuces we plunked in there a few weeks ago. These are our weekly Salad Greens until the others begin to grow outside. We’re always sowing new seeds either in soil or in pots/cells. 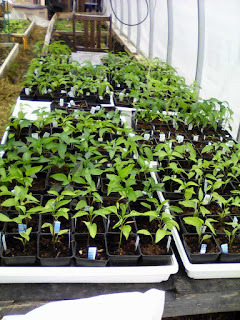 Today we sowed in pots many herbs and flowers after re-arranging most of the tables and shelves in the greenhouses to hold about 20 more trays of peppers we brought from the house yesterday and today. Just when it seems we’ve run out of space, we find yet another table to clear for more plants. Transplanting to outside helps free up some shelf space too. The next few weeks will be a frenzy or outdoor sowing and transplanting. Tomorrow and Friday, after picking, washing and packing Salad Greens and harvesting sprouts and microgreens for you, we’ll transplant more broccoli, rapini and kale along with onions, leeks and beets to the garden beds and we’ll re-arrange the shelves yet again. Weather these days, and nights, plays a big part in when and where everything goes, whether on or off heat mats, high or low on shelves, in or out of light and covered or not covered. There are many decisions to make from hour to hour each day, some from experience and some from plain old experimenting and hoping for the best. Not every decision is the perfect one, but we do our best. Again, thank you for saving these for me. I can cut about 15 labels from each container and we use about 200 a week right now – and we’ve just begun up-potting from 72 plants per tray to 18 per tray. I’m happy to receive any and all you can provide to me. I’m happy to provide your fresh produce in containers provided by you. If you order similar items each week and let me have containers for yours, I can fill them for you and begin a cycle of filling/washing/returning/refilling etc. THUS using less plastic bags.